Anax aspires to join The Academy, the elite institution which runs the utopian society she has brought up in and with the help of tutor Pericles, she has been working hard to prepare for the gruelling admittance interview which lasts for five hours and focuses on one subject only. Anax has chosen to focus on Adam Forde, her long-dead hero. But as the interview takes its course, Anax begins to discover that all she has learnt is not the whole story and starts to question her belief on not only Adam but more importantly what ideals her society is based on. Is The Academy really what it seems, and why exactly are they allowing her to uncover so much about what is at its core? Set in a futuristic society, which was created on a remote island of New Zealand and protected by huge sea fences after a world-wide conflict which eventually resulted in biological warfare at the end of the 21st century, this book brings forward many philosophical questions, most of them occurring in the transcripts of conversation between Adam and Art, a robot. These philosophical musings about genetics, artificial intelligence, evolution, and the nature of the human condition is hard-going albeit thought-provoking. It is fascinating stuff, but this is definitely one for the more eloquent reader as far as teenagers are concerned. The final twist, the reader soon realises, has been achieved by the author’s deliberate omittance of certain details, remains astonishing regardless (some people might have worked it out half-way through the book, I certainly did not!). But straight after this revelation, the penny drops and it is a whole other story that unfolds under your eyes. What is so clever here is that this surprising ending is only based on the fact that throughout the story the reader makes certain assumptions on Anax and the other characters in the story and how the events must have unfolded. Beckett knows that and plays on it. It is clever … you think you have been fooled, but really you have fooled yourself into thinking that the outcome of The Final Dilemma could only go one way. 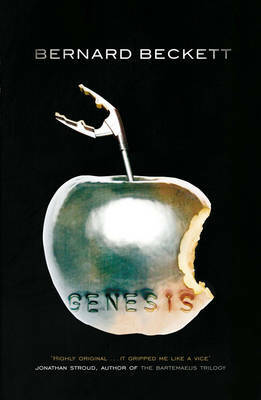 Genesis is a real page turner and one that benefits from being read in one sitting (it is only a novella). There is definitely a trend to publish dystopian novels for young adults at the moment (Hunger Games, and the Chaos Walking trilogy to cite an amazing few! ), and I for my part think this is a great thing. With all the dumbing down going on around them, teenagers will welcome books that treat them like the intelligent and open-minded beings that they are. I really really want to read this book. I love dystopias and I think this author is really interesting. I read an article in New Scientist online where Beckett argued that some Atheists are almost religious in their views. It was fascinating. Great review.